In this verse he sings, 'This is Arunachala-Siva, the ocean of grace that bestows liberation when thought of''. In order to understand more fully the importance that Sri Bhagavan attached to the name and form of this hill, it is necessary for us to take a broad view of his teachings. In verse four of Ulladu Narpadu (The Forty Verses on Reality) Sri Bhagavan says, 'If oneself is a form, the world and God will also be likewise'. That is, they will also be forms. In the first line of the third verse of Sri Arunachala Ashtakam he addresses Arunachala and sings, 'When I approach you, regarding you as having form, you stand here as a hill on earth'. That is, so long as we identify the body as 'I', it is equally true that this hill is God. Indeed, Sri Bhagavan used to say that because we identify the body as 'I', Lord Siva, the Supreme Reality, out of his immense compassion for us, identifies this hill as 'I', so that we may see him, think of him and thereby receive his grace and guidance. 'Only to reveal your [transcendent] state without speech [i.e. through silence], you stand as a hill shining from earth to sky,' sings Sri Bhagavan in the last line of the second verse of Sri Arunachala Ashtakam. Being the perfect spiritual Master that he was, Sri Bhagavan knew well how important and necessary is the form of God for the human mind, which is ever attached to forms. And from his own personal experience he knew the unique power of the form of Arunachala, a power that cannot be found in such abundance in any other form of God, namely the power to turn the mind towards Self and thereby to root out the ego. In verse eleven of Sri Arunachala Patikam Sri Bhagavan exclaims with joy and wonder, 'Lo! How many are there like me who have been destroyed by thinking this hill to be the Supreme… ,' thereby assuring us that if we regard this hill as God, our egos will surely be destroyed. 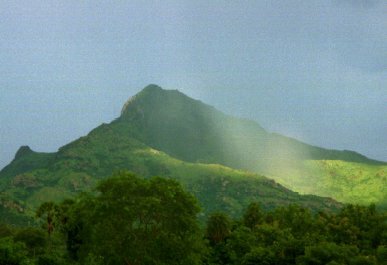 Though Arunachala appears outwardly as a hill of mere insentient rock, the true devotee understands it to be the all-knowing, all-loving and all-powerful Supreme Lord, who is guiding him both from within and without at every step and turn of life, leading him steadily and surely towards the goal of egolessness. 'What a wonder! It stands as if an insentient hill [yet] its action is mysterious - impossible for anyone to understand,' sings Sri Bhagavan in the first line of Sri Arunachala Ashtakam. There are many incidents in the life of Sri Bhagavan that illustrate his great love for the divine name Arunachala, but perhaps the most striking occurred during his last moments. About twenty-five minutes before he left his body, the assembled devotees began to chant Aksharamanamalai. Hearing the name of his beloved Arunachala, Sri Bhagavan opened his eyes, which shone with love, and tears of ecstasy rolled down his cheeks. Though Sri Bhagavan never gave mantra diksha nor formally accepted anyone as his disciple, many devotees believe that Arunachala is the nama-mantra that he has bestowed upon the whole world. When a Guru formally gives a mantra to his disciple, he explains to him the meaning and significance of each letter of the mantra and tells him the fruit to be gained by meditating upon that mantra. In the same manner, in the second verse of Sri Arunachala Navamanimalai Sri Bhagavan has explained the meaning of each syllable in the name Arunachala and he has declared that mere thought of this name will bestow liberation. From this we can infer that Arunachala is the jnana-panchakshari, the five-syllable mantra that bestows jnana. Moreover, tradition tells us that when a mantra is given by a jnani and when he explains the significance of each syllable of that mantra, he is actually putting his own power into that mantra. Therefore, if any devotees of Sri Bhagavan wish to have a mantra, they can very well, take Arunachala to be the mantra openly given to them by him. The words 'Smaranat Arunachalam' mean 'by remembering Arunachala', and they occur in the very same Sanskrit verse that says that by dying in Kasi one will attain liberation. Bhagavan then turned to the revolving bookcase by his side and took out a book,probably the Arunachala Mahatmyam. Opening it as if at random, he read out a sentence in Tamil that said, 'One ''Arunachala'' is equal power to one crore ''Om Nama Sivaya'''. 'Om Nama Sivaya' is believed by Saivas all over India to be the most sacred and powerful mantra. After reading out a few other portions of this book that emphasized the unique greatness and power of Arunachala, Sri Bhagavan finally laid it aside and explained to the devotee that not everyone can see Chidambaram, not everyone can be born in Tiruvarur, and not everyone can die in Kasi, but anyone and everyone can think of Arunachala from wherever they may be, and thereby they will surely attain liberation. From this incident we can understand how unhesitatingly Sri Bhagavan encouraged devotees to have absolute faith in Arunachala. If devotees of a sceptical frame of mind came to him and asked him how mere thought of Arunachala could bestow liberation, he used to explain the allegorical significance of this saying, since that alone would satisfy their mind. (4) But if devotees came to him with simple, child-like faith, he would strengthen their faith and confirm the literal meaning of this saying, since he knew from personal experience the great power of the name and form of Arunachala. Whenever Sri Bhagavan asked about the special sanctity of Arunachala, he used to explain that other holy places such as Kailas, Kasi and Chidambaram are sacred because they are the abodes of Lord Siva whereas Arunachala is Lord Siva himself. (5) However, as the above verse of Arunachala Mahatmyam says, Arunachala is a secret kshetra. Because it is this place that bestows jnana and because most people have so many other desires and do not truly want jnana, Arunachala has always remained comparatively little known. But to those few who seek jnana, Arunachala always makes itself known through some means or other. (1) This verse is the fifth of the seven verses that Sri Bhagavan selected from the Arunachala Mahatmyam and translated into Tamil. (2) In Talks, talk no. 273, it is recorded that Dr Syed once asked a similar question to Sri Bhagavan, who in reply pointed out that the hill had attracted to itself all the assembled devotees, including Sri Bhagavan himself, and that the power of the hill therefore could not be denied. (3) The futility of trying to conceive God as being formless when we are unable to know ourself as the formless Self, is well illustrated by a dialogue that Sri Bhagavan once had with some Muslims, which is recorded on p. 28 of Maha Yoga and in Talks, talk no. 121. (4) An example of how Sri Bhagavan used to give this type of explanation can be found in Talks no. 473 (p. 448). (5) See similar comments recorded in Talks, talk no. 143, and Sri Ramana Reminiscences, p. 37. (6) Though Arunachala is generally considered to be one of the panchabhuta-lingams, Sri Bhagavan used to point out that It is truly not a lingam of ordinary fire, which is one among the five gross elements, but is a lingam of the fire of knowledge (jnanagni), the fire that burns the ego to destruction. Download Russian translation of this article.